Bright, fun, eye-catching and versatile, perfect for all your promotional programs. 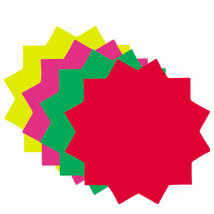 Boxed in rainbow packs of 100 cards - 25 each of fluorescent red, yellow, magenta and green. Choose from three sizes.